The Lady Minutemen fell behind 13-0 at the start of the game and had to fight an uphill battle the rest of the way but cut the lead to six in the third. Coach Smalley expressed how proud he was of the squad as he stated, “We started out extremely flat after playing six out of the last eight days. However I went home feeling really positive about this team because everyone gave a super effort after being down early.” Coach Smalley called on everyone on the team in this one and the team gave a solid effort after the first quarter. 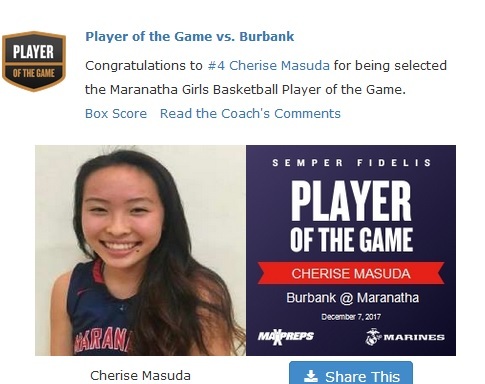 Senior pg, Cherise Masuda lead the team with her first double double of the season 12 points and 10 assists. Sophomore guard, Patil Yaacoubian delivered nine points, seven rebounds and five assists. Junior forward, Erica De Guzman scored eight points and grabbed seven rebounds while Freshman guard, Emily Jordan continued her strong play off the bench with seven points, six rebounds and two steals. Freshman, Taliana Marganian scored six points and nine rebounds before fouling out. The Lady Minutemen will be in action Friday at 3:30 to conclude the Burroughs Tournament with a game against Agoura High at Providence High in Burbank.